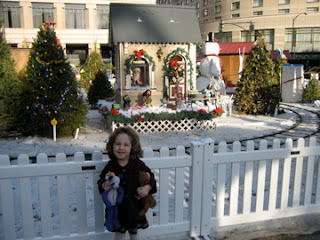 On Wednesday afternoon, I took Elise to see Santa. She'd been pretty excited to let him know that she wants a new computer for Christmas (the Barney one inherited from cousins being entirely outgrown long ago) so I wanted to be sure she got the chance when the lines weren't too long. 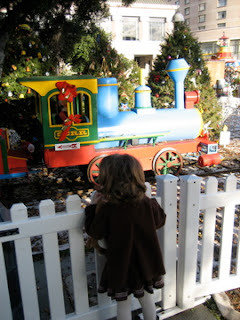 We hopped on the train to go to San Jose's Christmas in the Park, and while we waited for Santa to arrive there we looked at the decorations around the park. Fun kitsch. A nice big girl came up to Elise while she was waiting on a bench and talked to her about her toy kitten and talked with her about Santa, which I thought was cute. 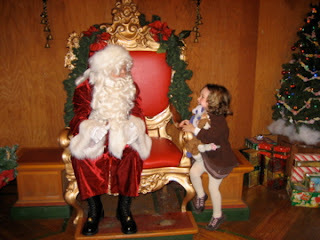 When it was our turn to see the big guy, Santa and I simultaneously pointed out that there was a nice seat next to his chair, so she need not get too close if she didn't want to. That was a pretty good thing. And, here is the photo sequence from their visit together. 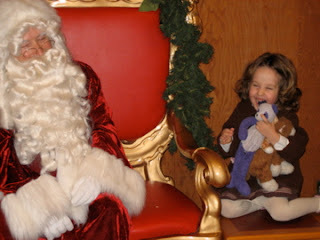 Nervous giggles turned into big giggles as Santa laughed with her. 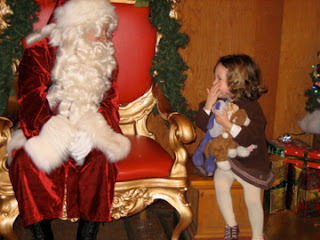 At the end, I helped her out by telling Santa about how very much she wants a new computer. And a Diego puppet, but I suspect Santa will only be bringing the computer. 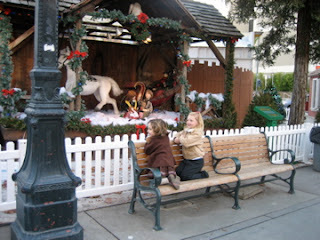 Santa seems to be in a pretty good mood when he's in downtown San Jose, so we'll likely visit him there again in years to come.